To celebrate the start of Sydney is Fashion, I wanted to offer my readers the opportunity to flex their creative writing skills. Caption the above photo in the comments, Instagram, Twitter, Facebook or LinkedIn and you could win a “Style and Safe Bicycle Journey Consultation.” (Value AUD 500). Your consultation might even end up as a blog post! I’ll help you to select some great outfits from your current wardrobe for your bicycle journey. We can work together to choose a safe path for your commute and I’ll accompany you, if you like. If you’re looking for a new bicycle, I’d be happy to introduce you to Omafiets Dutch Bicycles in Redfern. Winner to be selected based on degree of wit and humour and announced on “Fashion Saturday” 5pm, 12th September. Best of luck and I’ll look forward to meeting you! Today’s ensemble: “Vonda” by Leona Edmiston, Easy Spirit heels, Yakkay helmet, Witchery sunglasses, Cartier Santos, J.Crew cuff, Gazelle CityZen S9. 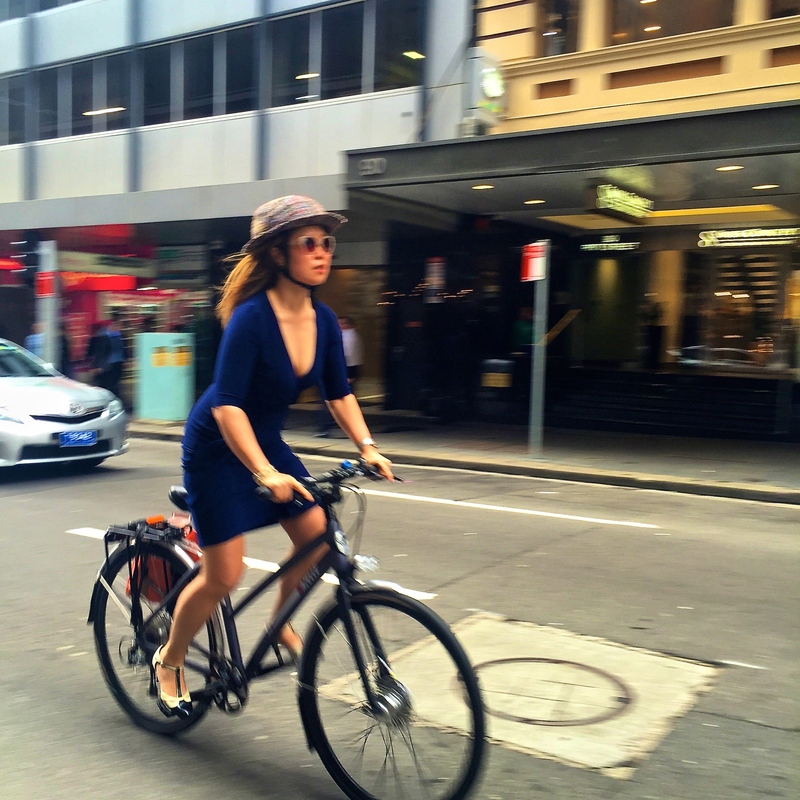 “Vonda” is a great dress for going fast on Pitt Street, Sydney. If you lead the way, I will follow!